Kathmandu University School of Science (KUSOS) announces Provisional Admissions to M.Sc. in Physics for the first time, in collaboration with the European Organization for Nuclear Research(CERN) Geneva, Switzerland with possibility of invited faculty and internship for students in largest particle physics laboratory in world at CERN. 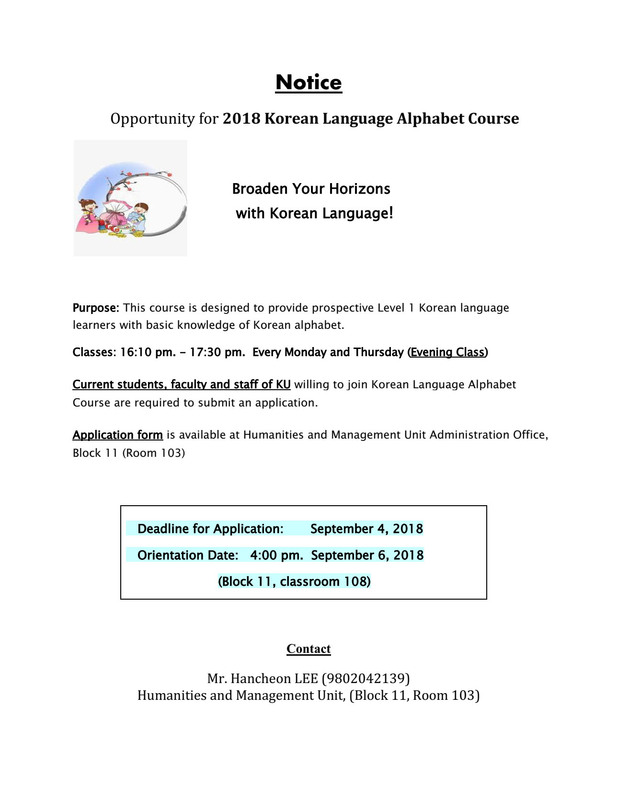 All eligible applicants are informed to fill the application form and submit to the concerned office of the Head of the Department no later than 7th September 2018. All theory classes shall be held in KUSOM building, Balkumari, Lalitpur from 3-7 pm. Practical classes shall be conducted in Dhulikhel Campus. Eligibility: Candidates who have completed 4 years Undergraduate/Bachelors' degree in Science with Physics major and minimum 2.0 CGPA or 50% in aggregate marks are eligible to apply. 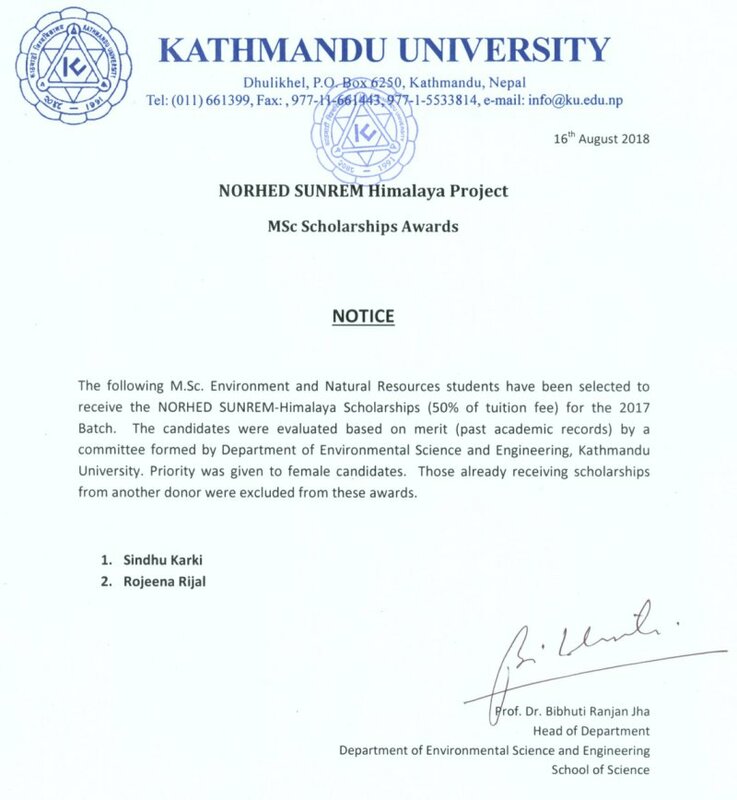 Submission of Application: Application forms are available at the Office of Head of the Department of Natural Sciences, School of Science, Dhulikhel, Kavre, or on-line at Download (www.ku.edu.np/kusos) at the Kathmandu University website. Submit completed application form along with photocopies of previous academic and citizenship certificates to the concerned Office of the Head of the Department. Application with scanned documents submitted to email address given below is also accepted. Only short listed candidates will be informed to appear for written test and/or interview. Application fee of Rs. 1500/-(non-refundable) may be deposited to Nepal Investment Bank Limited A/C No. : 00501030250009 at the time of interview. Dr. Gajendra Sharma's article entitled 'information Technology Acceptance and E-business Adoption in Organizations' has been published recently in a book entitled Advances in Business and Management, Volume 15 (edited by William D. Nelson), Nova Scientific Publishers, New York. The candidates who have applied for Participation in Industry Case Presentations of EU, under the Capacity Building in Sustainability and Environmental Management (CapSEM) Project, which is funded by Erasmus+ Programme of the European Union, to visit companies in the Netherlands, Norway and Portugal from 21-28 October, 2018, are called for an interview as per the following schedule. 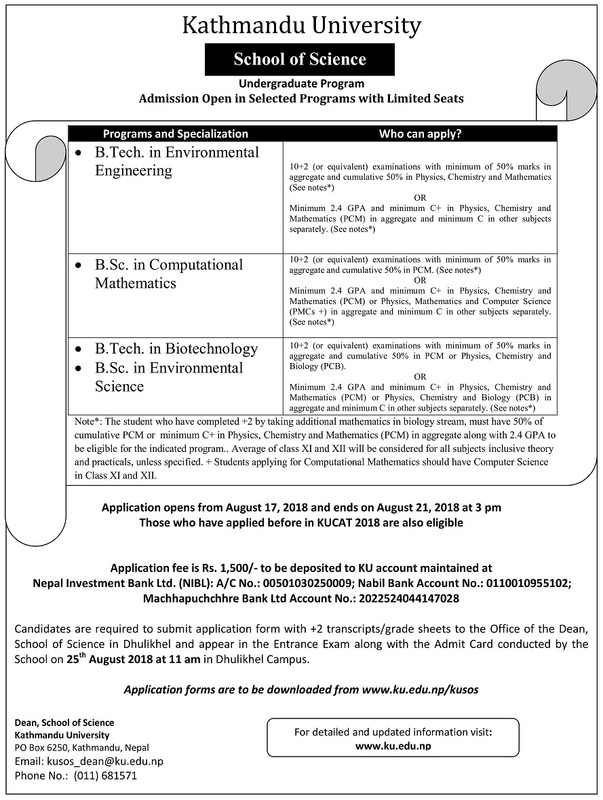 Kathmandu University, School of Engineering invites application from the candidates who have scored 528 or more in KUCAT- 2018 for admission in the Chemical Engineering Program. Application should be submitted to the concerned department from 3:00 P.M. until, 13th August 2018. Name, KUCAT ID and KUCAT score should be clearly mentioned in the application form. Candidates should meet the admission criteria as originally announced. Candidates who have already been enrolled in any one of the undergraduate programs and candidates who have submitted withdrawal request are not eligible to apply. Request for the extension of the deadline will not be considered. Admission will be on Merit Basis. If any seat is vacant in other programs of Engineering, concerned department will notify the candidate as per merit basis from waiting list. Kathmandu University Executive Committee has recently approved the establishment of the Pat Hall Endowment Fund which will support the studies of two MS by Research students at the Department of Computer Science & Engineering. The fund has been established to mark the tribute to late Prof. Pat Hall who was a Visiting Professor to the Department of Computer Science & Engineering, Kathmandu University during the period 2007-2015. Prof. Hall passed away recently in July 2018. The endowment fund's current target is to raise 8 million Nepali rupees out of which Kathmandu University has already allocated 2.2 million rupees from the School of Engineering Research Fund and other Projects run by different faculties at the Department of Computer Science & Engineering. In order to raise the remaining amount, we have approached donors, friends and families and the initiative has received warm and positive responses. We aim to complete the initial target of the fund raising drive by July 2019. School of Science announces Departmental Orientation on 12th August 2018 for Freshers’ 2018. All Freshers are informed to contact concerned Department at 09.30 am on the specified date. There is Plantation program after the Orientation at 11.45, thus all are advised to come with comfortable shoes.